Bring 3 inches of water in a medium saucepan to a boil. Insert a craft stick into the top end of each apple. Dip the apples, 1 at a time, into the boiling water for 20-30 seconds, this will remove the wax coating on the apples. Dry thoroughly and place onto a sheet pan lined with parchment or wax paper. Prepare the caramel by adding caramel candies and milk to a medium saucepan over medium heat. Stay close and stir often while the candies melt. Once melted, remove from heat and allow to sit about 1 minute. 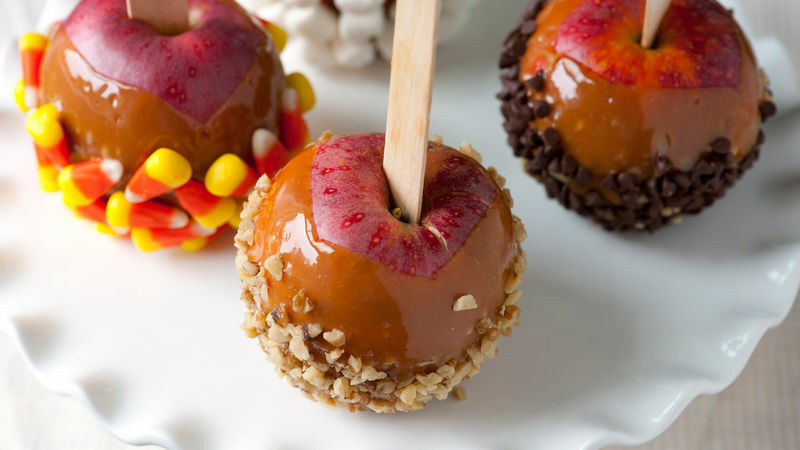 Dip each apple in the caramel, turning slowly to coat. Continue to turn, allowing any excess to drip back into the saucepan. If desired, dip the bottoms of each apple into nuts, chocolate chips or other garnish. Cool apples completely on the prepared sheet pan then wrap individually and store for 2 to 3 days in an airtight container. For a layer of chocolate, once the caramel has cooled completely, dip the apples into melted chocolate, then nuts or desired garnish. Place the cooled caramel apples into gift baggies, tie with a pretty ribbon or string and give as take-home favor or gift at your next party.